The University City community, both north and south, needs to unite to have the City Council force the water department to change their proposed route from Pt. Loma treatment plant to the new Pure Water plant being built on Miramar Road. The current plan is to trench through University City down Genesee Avenue to install a 48″ raw sewage pipe pumped under pressure and a 30″ brine pipe. This will take up 1 1/4 traffic lanes and will have to pass through the Genesee and Governor intersection opening soil with toxic gas station waste. We should all oppose this. The alternate routes east of 805 were proposed to the water department by the UCPG using the SDG&E easement or the Miramar land location, and both were rejected. Now the City Council needs to hear from the community. What can you do? Attend the April 10 City Council Meeting at City Administration Building 202 “C” Street, City Council meeting 12th floor; hearing scheduled for 2 PM. Check Council Agenda online to verify time. Over the last several years, I have endeavored to write a column for the UCCA newsletter that informs residents of the important items discussed at the UCPG in an understandable fashion. 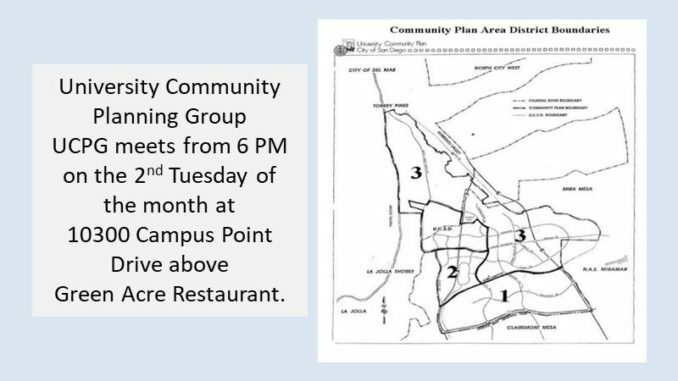 As an elected member of UCPG and a UCPG representative on the UCSD Community Advisory Group, I dutifully do my homework and review all plans brought before the group, attend and participate at all meetings. I am also a member of UCCA and previously gave a UCPG report at that meeting, but these two worthwhile organizations each have their own different unique role. However, I do not see everyone understanding, or even wanting to know the differences between the two groups. The roles should be complimentary, not duplicative. It was unfortunate that strong accusations were made at the March meeting casting doubt on the legitimacy of voting and membership criteria. The By-laws of UCPG which are posted on line by the city, were followed. The people on the UCPG are volunteers from your community and should not be denigrated. Let’s not divide, let’s all stand together to make positive improvements in U.C. I urge everyone to attend the UCPG meeting once a month on the second Tuesday of the month and participate. Notice of Public Hearing: On April 10, the San Diego City Council is scheduled to hear the case for approving the City’s Pure Water Project at 2:00 pm (Council Chambers, 12th Floor, 202 “C” Street). UCCA, UCPG, and UCCF have all voiced opposition, not to the project itself, but to the sewer pipe alignment along Genesee Ave/Town Center Drive. Editor’s note: Submitted by Nancy Groves, UCPG Rep District 1 .